Wordpress Group Chat Room Plugin, Html, Buddypress, BBpress. Download and Install the group chat plugin. Download the chat plugin . Install the Plugin. Activate your group chat plugin. Register and Create your chat. 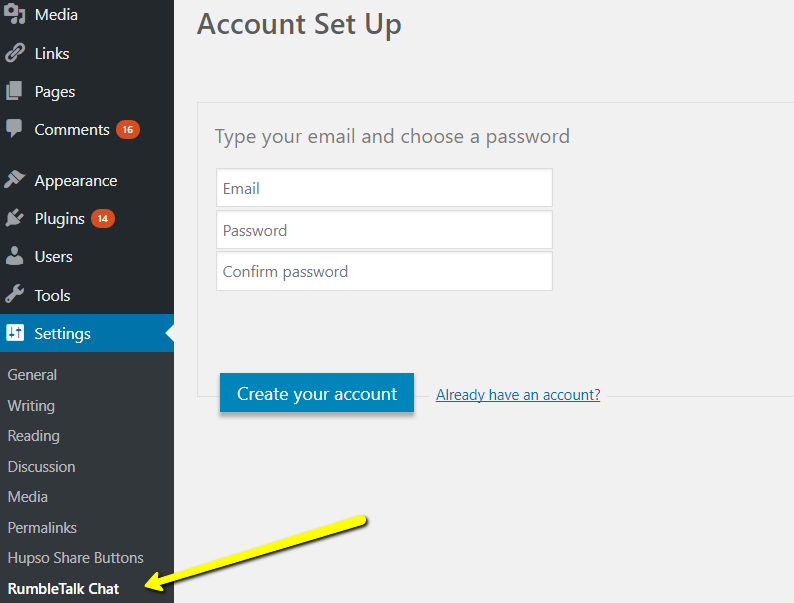 Go to Wordpress Settings, to RumbleTalk Chat and register (email and password). If you have already an account, click on the "Already have account?". Now add your 2 fields token hyper link and add your account token (two fields that can be found in your admin panel under Account). After registering, your chat code (hash) will show in the chatroom code field. Your hash is a unique string for every chat room. 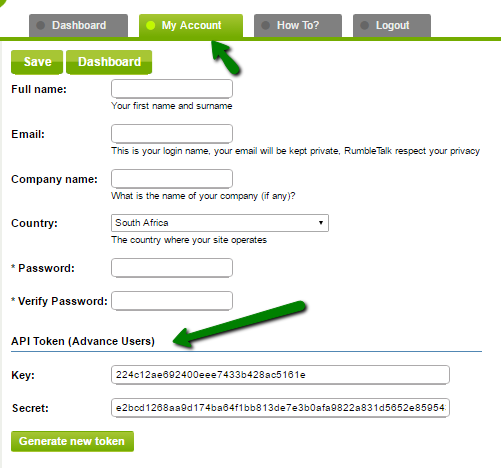 * In case you do not get the hash code, you will need to manually register at RumbleTalk Site and get your code. Now for the setting of your chat room plugin. Add Chat room - create more chat rooms. Members - Connect your chat to your members users base. This will let your members to auto login to your chat without the need to login. Size - Control the chat width and height. Note, in some wordpress themes the size of the chat might be smaller or longer than expected. In that case, see troubleshooting below. Floating - If you want your chat to show as icon in the lower right corner. Settings - change the look & feel of your chat, create moderators, put the chat offline and much more. In this step you can control any aspect of your chat. Choose the width and height, the type of chat notmal or floating (toolbar chat). 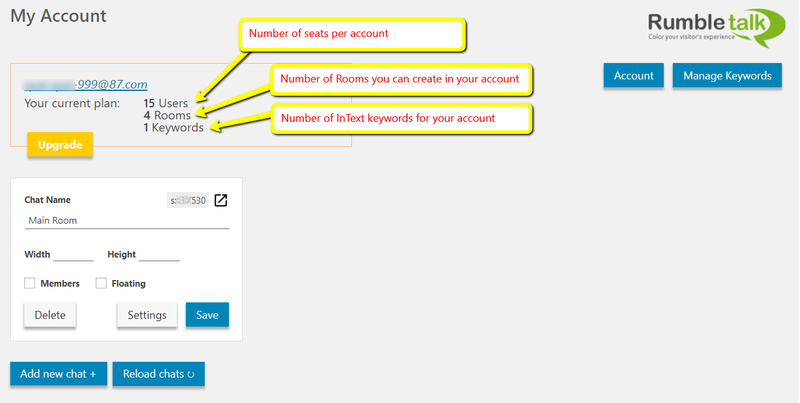 You can integrate your own users base with a click. Finally you can customer the chat behaviour as you like by clicking the setting option. To add RumbleTalk group chat to your site, go to a page or post in your wordpress admin. In case you have only one room, use the phrase [rumbletalk-chat] in your posts visual mode (you can do it in the visual mode, no need to switch to HTML view) in order to position the chat widget exactly where you need it. In case you have more then one room, use the green button or add manually the exact hash in the phrase [rumbletalk-chat hash="insert here your chat hash"] . Go to your website to the page you just added the chat, you should see the chatroom in your page. If you could not complete your registration (meaning you have no hash code shown in your plugin settings), you should go to www.rumbletalk.com. Sign-in and get your chat code. Than you will return to the plugin go to the "I already have my RumbleTalk Chatroom code" and manually add your chat hash code. Than copy the following code (java script). Add the chatroom code below directly into the text code(not the Visual mode) of the page. Copy and paste the code below into your html, make sure you replaced the chatcode with your own chatroom code. Advance users: for advance users that wish to add the group chat into every page of the website. There is a possability to add the code a to the footer file of wordpress. If you want to use your own users base for automatic login. you should make sure your settings is correct. Read more here.